Recent nominations for the next Nobel Peace Prize range from a Pakistani school girl to superpower leader Vladimir Putin. Some scientists and whistle blowers of note have also been mentioned. But a significant Middle Eastern peacemaker listed in Time Magazine's ranking of the most influential figures of the year failed to make the grade. Because he heads an organization branded by Middle Eastern power brokers such as the U.S., the EU and Israel as anything but peaceful, it is not surprising that imprisoned Kurdish leader Abdullah Ocalan is not a Peace Prize nominee. 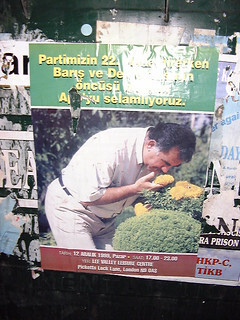 Confined on the Turkish Island of Imrali off the coast of Istanbul for the last fifteen years, Ocalan has provided ideological support for millions of Kurds and their guerrilla army of men and women who fight to realize the elusive dream of an independent Kurdistan, committed both to self-determination and human rights. Those who dismiss the possibility of an independent Kurdistan need to think again. Ocalan has faithfully nurtured the ten-thousand-strong fighting force of the Kurdistan Worker's Party (PKK), a third of whose members are women and which now commands recognition as more than a player in the region. Ocalan began peace negotiations with the Turkish government nearly a year ago, and terms of an agreement were instituted in March 2013. Since then, Ocalan has shown remarkable patience in maintaining the peace, despite the government's stalling on PKK demands and its brutal suppression of protests by his countrymen and women against ongoing abuses. Ocalan has also shown generous forbearance to certain Western countries, to Saudi Arabia, Israel, and Turkey, and to Massoud Barzani's Kurdish Regional Government, all of which have aided attempts by Islamist extremists in Syria to oust the Assad regime. Had these powers been prepared to listen, he would have informed them that consultation with the PYD forces of the Kurdish Democratic Union Party in Syria was vital to their success. In the same way, desired change in Iran might rest on co-operation with the Free Life for Kurdistan Party's PJAK leaders. Meanwhile, from their Iraqi base in the Kandil Mountains, Ocalan's commanders direct their campaigns to liberate Syrian South Kurdistan, Turkish North Kurdistan and Iranian East Kurdistan. Victories in Syria have already led to suggestions that the Western powers and their allies need to take more notice of the PKK's secular, democratically focused goals. These have resonated at the Kurdish grassroots level and promise to create an even more significant bulwark against Islamic extremism (1). The West also cannot afford to ignore the crucial geopolitics of the Kurds' territorial claims and successes, based, as they are, on the Median (ancient Kurdish) Empire's two-and-a-half-thousand-year-old Aryan culture and civilization. Ocalan was born in a village in eastern Turkey, to a family that must have frequently witnessed the government's oppressive treatment of its Kurdish minority. As he grew to adulthood, Ocalan's wide-eyed childhood innocence turned to deep, brooding resentment, setting the stage for his adoption of Communist theories during his university days. He soon joined forces with like-minded young Kurdish student dissidents, whose experiences of poverty, cultural repression and denial of human rights inevitably produced a resistance movement that became the PKK, the Kurdistan Worker's Party. Ocalan's attitude never changed. 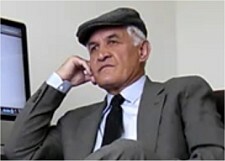 As a familiar presence on film, he was seen with doves and new recruits in his earlier days, explaining his party's policies and responses between clips showing PKK fighters in battle, mass funerals of Kurds, or authorities abusing Kurdish protesters. As supreme commander, Ocalan's darkly angry eyes constantly fire challenges at those who would decimate his people. His voice, carefully modulated in statesman-like control, rises to insistence on his strongest points, while the constant friction between his thumb and forefingers reveals the constrained energy of his commitment to a free and democratic Kurdistan. Another scene on film cuts to Ocalan's sparse cell in Imrali, where a neatly filled bookcase stands beside a window whose opaqueness is either real or reflects artificial lighting. This is the place where "Apo' ("uncle" Ocalan to the thousands of young fighters who he has asked to surrender everything for Kurdistan) has composed four of his books. Not unexpectedly, it is clinical and uninspiring. But Ocalan's writings have given hope to every contemporary generation of Kurds, whether they deal with freeing women from the constraints of religious strictures and urging their independence; or questioning the viability of the nation state; or advocating democratic Confederalism. More recent pictures show Ocalan in better condition than he was following his capture in Nairobi by the Turkish MIT intelligence service (aided by unspecified Western allies). Pictures of him then suggested that the "blindfold' placed on him covered more than his eyes. The wide tape across his nose might have concealed an "injury," possibly due to the authorities' failure to safely lead him past "obstacles" in his incapacitated state. In pictures showing him caged in a cell at his trial awaiting a possible death sentence for involvement with armed gangs, Ocalan appears indifferent but nevertheless aware. The initial cadre of one thousand soldiers assembled to guard him intensified the irony of his solitary confinement (and the fear of the consequences that might follow his possible escape). The security overkill remained through the 2002 commutation of his life sentence and lasted until other PKK prisoners joined him in 2009. In 2010, yet another peace offer by the PKK was aborted when Ocalan's captors refused to negotiate on his living conditions and other protocols. Today, the specter of Abdullah Ocalan still hangs protectively over the cross-shaped geographical configuration of a hoped-for independent Kurdistan. In many ways, however, the future direction of the Kurdish freedom movement depends on the efforts of the commanders and fighting men and women who have persistently upheld the ideology Ocalan instilled in them. Now that Ocalan's reliance on force to achieve PKK goals has moderated, and if the present ceasefire with Turkey holds and peace is finally achieved in the rest of Kurdistan, perhaps Ocalan will receive the recognition that he deserves but has never expected.